Nintendo's Reggie Fils-Aime says that this console cycle will be a "three-horse-race" between Sony, Microsoft, and Nintendo. Going by the consistent rivalry between Sony and Microsoft during the months following the launch of their new boxes, one may have assumed that this generation's "console war" was being fought on just two fronts. But, if we took anything from the just-passed E3, it's that hey, Nintendo is still in this thing too. In fact, Nintendo of America president Reggie Fils-Aime assures us that Nintendo is actually in second place, with Microsoft trailing behind in third. "The dirty little secret is if you look at life-to-date numbers, between Sony and Nintendo they'd be pretty close in terms of PS4 vs. Wii U, with Xbox coming in third place," Fils-Aime told The Seattle Times. He added that "I think it's going to be a three-horse race for the balance of this cycle." 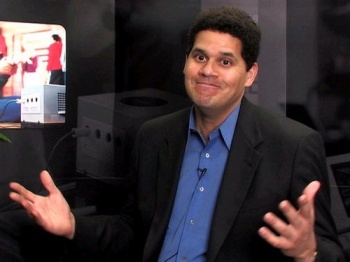 Furthermore, Reggie doesn't believe that we're due for a Wii U successor any time soon, stating that the console still has quite a bit of life in it. "We think that the Wii U has a long and vibrant life in front of it," he said. "What it needs are games like Mario Kart 8 and Super Smash Bros Wii U and Splatoon - those types of games that can really drive the installed base. We believe if we can do that effectively the Wii U has a long and robust life." He did, however, concede that the console's weak launch lineup was definitely something the company could have handled a lot better, explaining that when the company announced the launch date, it expected big hitters like Pikmin 3 and The Wonderful 101 to be launch titles. "The Nintendo quality bar is really what kept us from launching those games potentially in February or March and so that's what created the lack of software during that initial launch phase."